When browsing through the Article Library here at Lightsngear, you’ll see a link to the dangers of buying cheap lithium batteries. 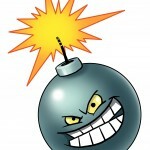 But of special note, is that the internet is full of merchants selling fake Ultrafire 18650 batteries. This article explains why you need to be EXTRA careful when pondering such a purchase! What you see in the photo is what a consumer found after disassembling an Ultrafire 18650 battery that they’d purchased online. 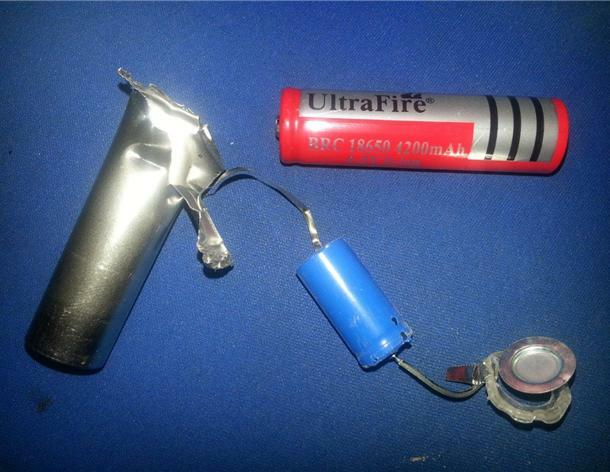 The battery in tact, is what the silvery object on the left originally resembled. After peeling off the label, they ripped off the top of the cell. This initially was the battery’s protection circuit (the attached disc on the right). But look at what the circuit is attached to! It’s a blue battery that appears to be nothing more than a 16340 rechargeable cell, placed INSIDE the large tube PRETENDING to be a much larger 18650! This is outrageous! This is where the manufacturer gleefully attempts to pull the wool over the eyes of the unsuspecting consumer. Obviously in the extreme case above, they’ve gone so far as to lie about the size of the cell they’ve so carefully wrapped. But in addition to it NOT being a 18650 in the first place, they also routinely misrepresent the capacities as well. In this case, the label reads “4200 mAh”. For one thing, the capacity of the uncovered cell in the photo, is probably around 500 mAh, maximum! It’s important that when you’re shopping for 18650 batteries, that you research what the CURRENT capacities are in today’s marketplace. As of this article date (to give you an example) the top capacity on a quality 18650 battery is about 3400 mAh (milliamp-hours). In order to sell more batteries (and hopefully impress the consumer) these no-name manufacturers use an existing name (in this case Ultrafire) and purposely inflate the capacity two to three times above what the current technology allows. As an example, a 2600 mAh battery becomes 3000 mAh. What should be a 3000 mAh cell, is now a 3400 mAh cell. Get the picture? Even in today’s world, it’s not uncommon to find some 18650’s being marketed at 5000 mAh!!! This is because the current technology is getting close to producing 4000 mAh cells. Even though history (perhaps inaccurately) cites P.T. Barnum as once quipping “there’s a sucker born every minute” the fact remains that even with all the information available today (such as this website) there are those who are just in too much of a hurry to buy something without doing the necessary research first. Now, I will admit, that if you search for reviews of Ultrafire 18650 batteries on Amazon, you’ll get a wide range of opinions. Many will say they’re great. And if you should somehow get a genuine Ultrafire battery, it might just be what it claims. 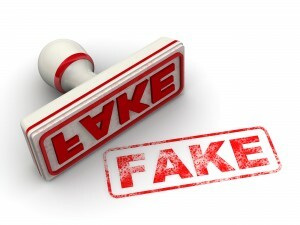 But traditionally, Ultrafire is NOT a trustworthy brand, and the fakes are everywhere! Quality varies alot. But it’s this inconsistency that SHOULD be a red flag! The prices aren’t much different than standard batteries! The last bullet is almost the most important. You cannot expect to get decent quality from a 18650 battery that is priced well below the cost of the average name-brand lithium cell! A brand-name lithium battery of this size should cost you no less than $15 each!! Even that price would be a bargain. Not $5 each!! (or less) Some brands of high-capacity 18650’s can cost up to $30 per battery! But, rest assured that with this price you’ll have a reliable product. We all know that some products are over-priced. But Lithium-ion batteries fall into the specialty category, and are in a class all their own. 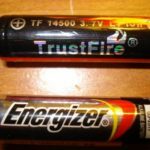 For your safety, take the points in this article seriously and be very careful of fake Ultrafire 18650 batteries when shopping online. Shopping for Lithium batteries isn’t without risk, but using the guidelines from this article should at least provide you with the essential knowledge of what NOT to buy! For an ample choice of Lithium batteries … including many that I highly recommend, click here. Please let me know if you have further questions about this subject, or leave me a comment in the spaces provided! Excellent information! I am ever budget minded so look for the best price of any item that I purchase. As you have pointed out, less expensive is not always to best. I appreciate the warning about what to look for when I need new batteries. Thanks! Many thanks for your input! Yes I am also budget conscious. I think we need to be these days. But unfortunately there are many ways in which companies can manufacture cheaper merchandise, and make them appear to be worth much more. Lithium batteries can actually be quite dangerous. 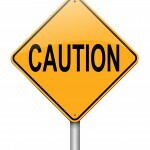 They’re among a small specialized group of products whereby if made poorly, can be hazardous to your health! Great post with very useful information… Wish I found it earlier before wasted money on cheap batter options. Won’t make that mistake again so I don’t mind paying more for better quality that lasts much longer! Thanks for commenting! So glad the article was helpful. Reminds me of when I worked in retail for a wireless phone company. People would buy those cheap batteries online and then wonder why their phone would not work right. Definitely pays to do your research as you said. Absolutely, James. I’m glad you’re familiar with these types of shady business practices. 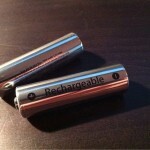 I always wondered when I purchase a product and they supply you with cheap looking batteries, why the ran down so quick. Cheeky buggers! Very true! A little extra knowledge is a helpful thing these days. 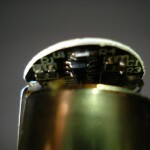 You state that a real 18650 should cost you no less than $15 each!! Even that price would be a bargain. Then you provide a link where you can buy said battery for 2 bucks. Who do you trust? Hi Bob, thanks for your comment. Prices DO vary, and in many cases you can find a sale on 18650 lithium batteries. I put $15 as a basic figure. For 18650’s with a lower capacity such as 2600mAh, $15 is probably about right. It could even be less if on sale. 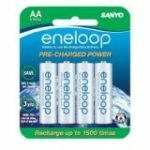 The link within the post has no control as to what price you’ll see batteries for. The purpose of the post was to inform the reader. As for the link…ultimately it’s up to the reader to take the information the post gave them, and sift through the choices they’re given. If you’re faced with bargain basement product at that point, simply know that it’s YOUR choice, but given the information the post provided you, it might not be the BEST choice. Thanks for commenting, but BLF is not in the habit of posting fake images. Besides, any possible rattle would be kept to a minimum due to the way it was wired in the cylinder. Although I’ve never seen a “branded” battery such as Samsung be of questionable quality, perhaps a bit more information might be helpful. Such as what is the claimed capacity? And I’m also assuming they’re unprotected. What color are they? Are they 30Q by chance? I found one of these fake UltraFire 18650 batteries in a headlamp I brought at a flea-market. It’s even spelled with a ‘l’ –>> “UltraFlre”. I drained the battery, put it on charge with my 18650 charger and monitor, it charged to full under 30 minutes, and consumed only 136mAh, while the battery states a whopping 6800mAh… I would be surprised if the actual total capacity is 150mAh….Definitely a fake. Thanks Martin… those pitiful capacities definitely confirm how bad these types of batteries can be! Sounds like that one came from the batch that mind did. I actually use those awful batteries to test the ‘low battery indicator’ on new flashlights I receive. Can you recomend a genuine make of rechargable battery for my head torch.as ive read these comments and found i have 5 of these batteries i purchased from ebay sometime ago . I don’t know if you like Amazon, but I did a quick UK search, and came across LG, Efest and Ocamo right away. Basically, any “known brand” (LG, Panasonic, Sanyo) is a good choice. But I also recommend Orbtronic & Keeppower. 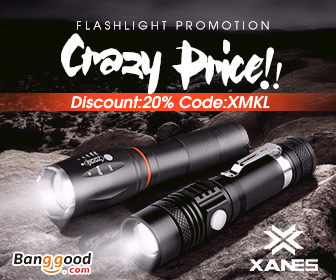 Other reliable batteries are those made by flashlight companies themselves! 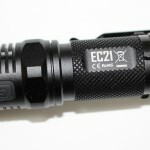 These include Nitecore, Olight, Jetbeam and Fenix. Sometimes what you’re actually getting in a flashlight-brand battery, is a (protected) Panasonic cell. What you also need to be aware of, are the differences between “protected” and “unprotected” batteries. “IMR” types are unprotected and are usually “high drain”. Most Panasonic batteries are not protected. They work great, but they need to be monitored more closely when draining, and be charged before reaching 3 volts. Hopefully this helps. Let me know if you have additional questions. Thank you so much for this article. I was about to buy 18650 3,7V 6800 mAh Li-Ion for $3 There was already something fishy about it because I have powerbank 10000 mAh and it is huge in size compared to this small battery. Thanks for the comment! Yes PLEASE don’t buy those batteries!! I’m certain they will be TERRIBLE performers. The size of the battery is the same as any other 18650. It’s the CAPACITY that counts, and 6800mAh is a bold-faced lie!